195 minutes of insights, guidance and tools for you to dive deeper into some of the flute repertoire´s most popular pieces, guided by no. 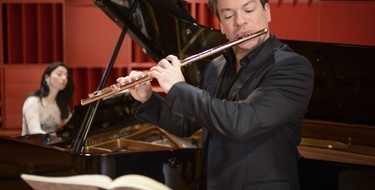 1 flutist in the world, Emmanuel Pahud. Prepare yourself for your next concert, audition or lesson and experience how you can take your own playing to the next level. All 15 flute excerpts come along as a print out ready PDF with all the sheet music so you can follow and play along. The solo piano accompaniment comes as separate video tracks so you can play along with top pianist Tanja Zapolsky and get the feel of rhythm, intonation, music style and phrasing. One of the all time most popular pieces of music of all time. AND...it has some spectacular flute music in it. Big contrasts, pure style and rhythmic structure are some key words for this excerpt. Playing lyrically together with the clarinet and bassoon might sound easy- but how to make it happen, that you will find out in this excerpt. A simple, yet challenging solo, because of it's simplicity. How to produce enough power without compromising the quality of sound is the challenge in this excerpt. Huge range of dynamics are in demand for this great solo of one of the core pieces of the romantic era. Colors and long lines in one of the all time most famous flute excerpts are key elements of understanding how to pull this off for an audition or concert. Virtuosity is in demand for this great flute excerpt. Clean technique is needed to pull this off correctly. How to do this? Pahud is ready to explain in great details. One of the most emotional pieces of all time. And with a flute part that plays a big role. Full expression and delicacy is needed to hit bulls eye for this excerpt. Firm rhythm, clear articulation and a good breath. This is important among many other things for this elegant and demanding flute excerpt. No further explanation... Bolero is a piece that everyone knows and the flute opens the piece and needs to be played calmly and in perfect alignment with that famous snare drum. Where to breathe is a key element in order to get this one right. This is the famous pantomime part of the ballet and gives the opportunity for all flute players to really show off all of their flute skills. Pahud explains in details and from years of experience what to look out for in this amazing flute excerpt. Use of vibrato, musical style and imagination within a tight frame work. This and much more is needed to play Salome as great as it deserves to be played. Incredible piece of music and incredible flute solo. Super virtuoso, fast and elegant. With other words: damn hard! Till is a challenge for even the most virtuoso and techicallly strong player. Fun and tricky at the same time. All Stravinsky's music is strongly rhythmical yet very emotional. This great opening states what kind of flute player you are. Firm and steely sound is in need for this last flute excerpt. Fabulous as always. No nonsense, no silly "fluteness" - Only music.